Story: Unless you're a parent or partner, it's even ruder in French to tell someone to shut up using this phrase than in English, because you're adopting an imperatively intimate pronoun and verb. But what Quentin (Gerard Depardieu) is saying to justify this commanding refrain is so blithely and loquaciously rude that he's lucky he escapes with the conjugation and a touch of attempted homicide. It's fundamental to realize, for instance, that the first syllable of his name is pronounced like a nasalised "con", and that's very rude indeed. It means what you think it does, but it's also a general term for a jerk or an idiot. Quentin is both a jerk and an idiot, but not a con. Like a holy fool, he is blessed with the ability to embellish his patter with the best rude words not in the dictionary. His child-like and goofy combinations build obscenities till he has composed a page of Rabelais. As you'd expect, the French use food, other nations and homonyms as resources for sexual slang. When they se branler, they polish the Chinaman. They peter as an art form, and when the cul gets in on the act, the prefixes and puns combine to produce une pute de merde de gros mots right in your gueule. Try using some of these expressions on the waiter when you send back le bifstek at Les Halles and you'll find out what I mean. 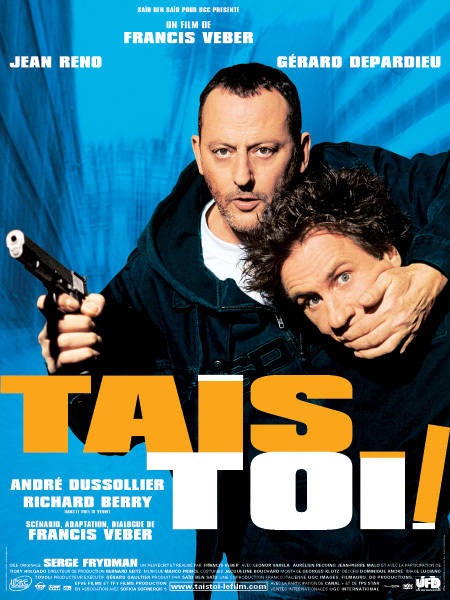 So as Depardieu bounds up like a slobbering collie and introduces his catch-phrase ­ "Je m'appelle Quentin et j'suis de Montargis" ­ he's already asking for trouble. Montargis' best-known monument is a dog. Depardieu celebrates the name with all the pride he brought to Cyrano de Bergerac. His victims gawp as he befuddles and insults them to the point of apoplexy. "You have eyes like a horse," he assures them. "It's lovely. It's like being in a stable." His physical clowning is beatific, but it's no wonder that he wanted to work with director Francis Veber on a verbal comedy where the sub-titles do their best, but which is much funnier if you hear some of the dialogue coming through in the original. Their last film was Le Placard. That does mean a poster. But it's mostly a closet in exactly the sense we use. Veber's previous effort was Le Diner de Cons. The English version is currently struggling with "twats' See what I mean? Besides writing dialogue that has the audience constantly giggling, Veber's plotting builds on the traditions of French farce to leave them on the floor. The teaming of blabbermouth Quentin with zip-lipped Ruby (Jean Reno) is heightened by Reno's vulpine features. Whereas Quentin can pass a psychiatrist's Rorschach by identifying it correctly as a bunch of ink-blots, Reno looks as if he needs heavy sedation, especially when being rescued by Quentin in a wandering crane. The film combines escapes, chases and finally buddies and bistros. This is one of Depardieu's most engaging performances.